Although you can find about as many different chord progressions as you can songs, you can count on some predictability in how chords follow one another in most songs you play on the banjo. This makes figuring out and remembering new chord progressions much easier as you encounter them in new songs. The chord progression of a song is the part of your musical road map that indicates what chords you play, in what sequence these chords occur, and how long each chord lasts before you move on to play the next one as you play a song. Many songs use only the G, C, and D7 chords. However, the more chords you know, the more quickly you can play along with new songs. Familiarize yourself with the chord progression of a new song just as soon as you begin to work on it. The chord progression not only lays out the form of the piece, but also provides the foundation you use later on for playing (and remembering!) the melody and for improvising. The chord progression is also what keeps everyone on the same page as you play a song with others in a jam session. In this situation, everyone plays through the chord progression repeatedly until all the players agree that it’s time for the song to come to an end. When you’re working through a chord progression, try strumming with an even downward motion of your thumb across all five strings of the banjo, striking all five strings in an even sweeping motion with the thumb. You’re working on the crucial new skill of changing chords in the left hand without losing the beat as you strum with the right hand. This takes a lot of coordination! If you don’t get it at first, take your time and keep trying. You can do it. 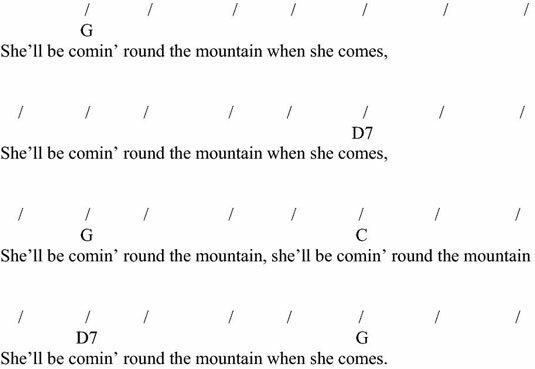 If you think it’s time to strum along with a song that just about everybody knows, “She’ll Be Comin’ Round the Mountain,” check out the following figure, which shows the lyrics with slash marks indicating where each right hand strum is played. Above the lyrics are the chords you’ll fret along the way. Check out Strumming and Changing Chords and Strumming “She’ll Be Comin’ Round the Mountain” and just jump right in and play along. The sooner you memorize the chord progression and pull your eyes away from the printed page, the quicker you’ll feel like you’re really playing music. Listen to how the chord changes relate to the melody as you get used to strumming and changing chords smoothly. Most new players find that the trickiest part of strumming along to a song like “She’ll Be Comin’ Round the Mountain” is going from the G to the C chords smoothly without interrupting the steady flow of the right-hand strums. If you run into this same problem, try switching back and forth over and over again between the G and C chords until you’ve mastered this transition.